#1. 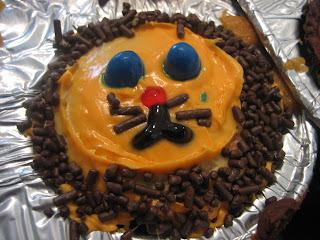 The cake: I decided to make Silas a lion cake. His two favorite stuffed animals are his puppy and his lion. He can say both words. So I wanted to go with one of the two animals. And when it came down to deciding, honestly, I just preferred the lion. It reminded me more of Silas I guess. 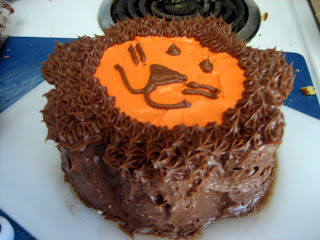 And the lion cake was super simple: 1 boxed cake mix (plus stuff to make the cake), one $0.99 large flower cookie cutter from Hobby Lobby, 1 tub of chocolate icing, one tub of vanilla icing, some orange food coloring, and a couple of icing bags and tips for decorating. 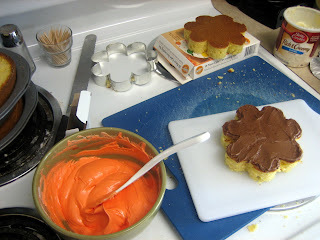 I could have easily made the cake a single layer, but I chose to make it a double layer. More to make a mess with! 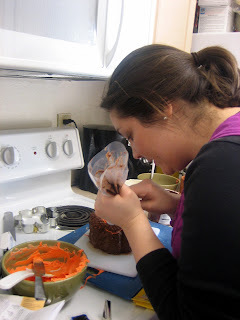 Making this cake was really important to me because I want to establish the tradition of always making special birthday cakes for my children. #2. 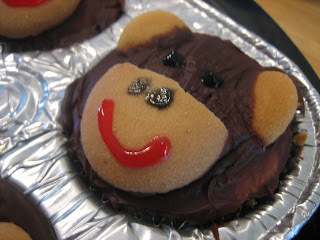 The cupcakes: Thanks to Aunt Brit, while Silas was enjoying his lion cake, everyone else was enjoying lion and monkey cupcakes! Brit did such a great job with these! Thanks, Aunt Brit! #3. The decor: Since we had the birthday party at the park, there wasn't much decor. 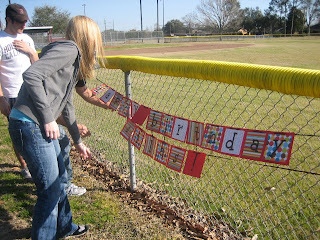 There were three helium balloons to mark our location and a homemade birthday banner. Hobby Lobby is awesome. I wish I had more time for crafty things. 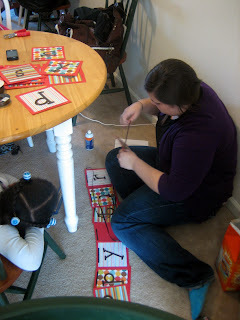 Thanks, Aunt Sara, for helping me with this project! 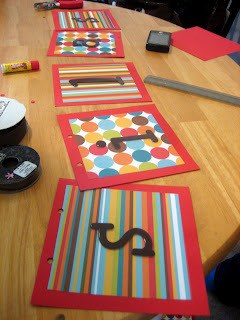 Supplies: red cardstock paper, 3 different kinds of patterned sheets of paper to match, 2 packs of cardboard letters, ribbon, and glue. I plan on using this banner for future parties! #4. 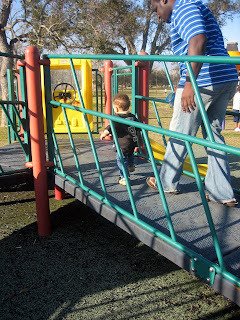 The Location: The park! 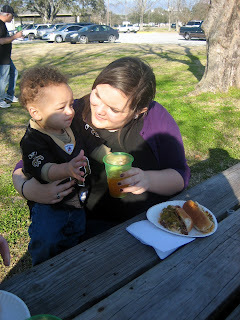 Silas LOVES to be outside! And the day was absolutely GORGEOUS! A true gift from God. 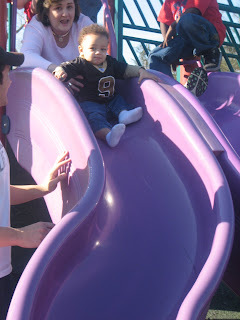 He had so much fun running around, swinging, and sliding. 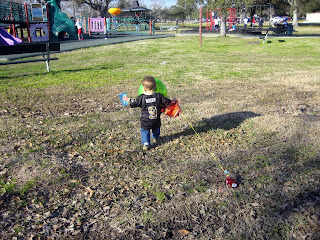 Below is Silas headed to the playground with his balloons. #5. 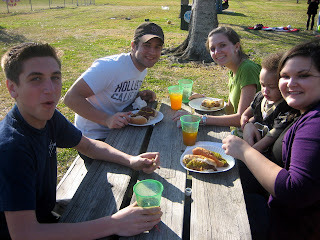 The Food: Thanks to my Mom we also enjoyed yummy hotdogs with chili! Everyone went home with a full belly! Thanks, Mom! I think that covers the prep. Be looking for the cake eating and present opening pics soon!